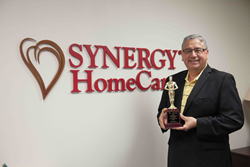 SYNERGY Home Care was named Small Business of the Year at the East Parker County Chamber of Commerce awards ceremony held on March 10, 2016. SYNERGY HomeCare is an in-home care services provider headquartered in Fort Worth and proudly serving a large region encompassing Greater Fort Worth, Weatherford, Mineral Wells, Granbury, and many other locations. Home care is a rapidly growing industry whose main focus is on facilitating “aging in place” for millions of retiring citizens. “Just getting someone’s day started by helping them with a shower, getting dressed and making their breakfast for them can mean a world of difference in their lives”, says David Laurenzo, owner of SYNERGY HomeCare. The company offers a wide range of services including personal care, companionship, assistance with daily activities, housekeeping, shopping, transportation to and assistance with medical appointments and other activities in support of families and their elderly loved ones. SYNERGY HomeCare differentiates itself from other, similar services, by being a true partner to their clients and their families. “Every family is different and we strive to come up with individualized solutions that will address the particular concerns they have in a manner that makes their lives work”, says Laurenzo, and adds “the peace of mind of not just our clients but their entire families is our only scorecard”. The company has unique processes in place that address continuity of care and reducing the risk of hospital readmissions. “People with health issues go from their family doctor to a hospital, to a specialized physician and then to a rehab. Many times, this cycle repeats several times before they ever make it back home. It is nearly impossible for a family member to watch over everything, advocate for their loved one and communicate with everyone involved. That is where we come in – we are always there, making sure someone keeps track of every step of our client’s medical journey, keeping all parties on the same page and doing our very best to reduce recovery time and get them home, safely”, explains Laurenzo. David Laurenzo opened SYNERGY’s doors in 2012 following his own experience with caring for an elderly relative. Today, SYNERGY HomeCare is proud of the recognition it has received from the Parker County business community and looks forward to continually serving local residents and their families.